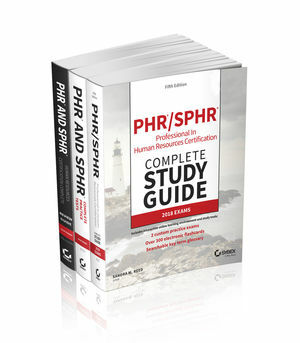 1,000 challenging practice questions to prepare for the PHR and SPHR exams! 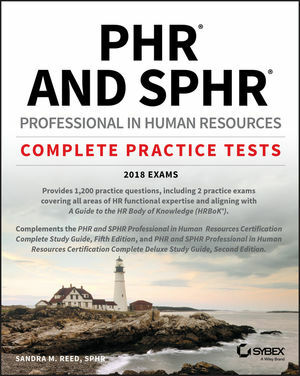 PHR/SPHR Professional in Human Resources Certification Practice Tests is the ideal complement to the PHR/SPHR Study Guide, Fifth Edition, PHR/SPHR Deluxe Study Guide, Second Edition, and Review Guide. These self-study guides are intended for HR professionals seeking to validate their skills and knowledge acquired through years of practical experience, or for relative newcomers to the HR field looking to strengthen their resume. These Practice Tests were developed to help certification candidates prepare for these challenging exams, especially for those needing more practice to review or refresh their knowledge right before exam day. The book aligns with A Guide to the Human Resource Body of Knowledge™ (HRBoK™), which details the responsibilities of and knowledge needed by today's HR professionals. Practice Tests reflect the critical HR topics that you need to understand as you prepare for the PHR and SPHRexams. Plus, you’ll get a year of FREE access to the interactive online learning environment and test bank, which includes full-length tests and practice exams—1,000 practice questions total! Sandra M. Reed, SPHR, is a leading expert in the certification of human resource professionals with more than 20 years of practical experience. She is the author of the Official Guide to the Human Resource Body of Knowledge (HRBoK) and the 5th edition of the PHR/SPHR Professional in Human Resources Certification Study Guide. Sandra, owner of epocHResources is a sought-after, engaging facilitator of exam prep and leadership training. She holds her undergraduate degree in I-O Psychology, and has been SPHR certified since 2007.